Few multimedia sound systems can boast that their predecessor was part of the permanent collection at New York City’s Museum of Modern Art (MoMA), but that’s exactly the claim the SoundSticks III speaker system can make. Taking its older sibling’s celebrated design even further, the SoundSticks III look is cutting-edge with a modern industrial design aesthetic, elegant black accents and a luminescent white LED glow. And though the SoundSticks III system may look like a visitor from the future with its transparent speaker covers, its exceptional performance makes it a more-than-worthy encore to its pop-culture predecessor. Realistic, room-filling sound and outstanding bass performance. Technically, the SoundSticks III system is “multimedia,” but once you hear it perform, you’ll realize it could easily become your primary audio system. With 40 watts of amplification producing rich, realistic sound, SoundSticks III offers strong bass output that makes all your music sound great – no matter where the audio is coming from. And with down-firing subwoofer amplifiers matched to the individual speakers, you can rest assured that each speaker will get exactly what it needs to deliver a consistent, optimal performance. Connect to virtually any media device. Other than its stunning good looks, the SoundSticks III system offers excellent compatibility with other audio components. Thanks to its 3.5mm stereo audio connection, SoundSticks III speakers can be used with MP3 players, portable CD players, computers and almost anything with stereo line-level outputs. By offering you this user-friendly option, SoundSticks III becomes a nimble addition to your desktop, bookshelf or entertainment center, keeping your life simple with a maximum of connection options – and a bare minimum of wiring. Touch controls for volume and mute. The SoundSticks III system makes it easy for you to interact with your subwoofer and “sticks,” offering sensitive touch controls for raising, lowering or muting the system volume. By responding to the gentle touch of your fingertip, this intuitive design feature makes your SoundSticks III system easy to operate, and keeps this work of audio “art” in the best possible condition. Down-firing subwoofer with volume control. In addition to 40 watts of amplification, the SoundSticks III system also features a six-inch down-firing subwoofer with volume control. By aiming sound down instead of at surrounding walls, your subwoofer makes your system less susceptible to adverse room variables – giving you a consistent performance. 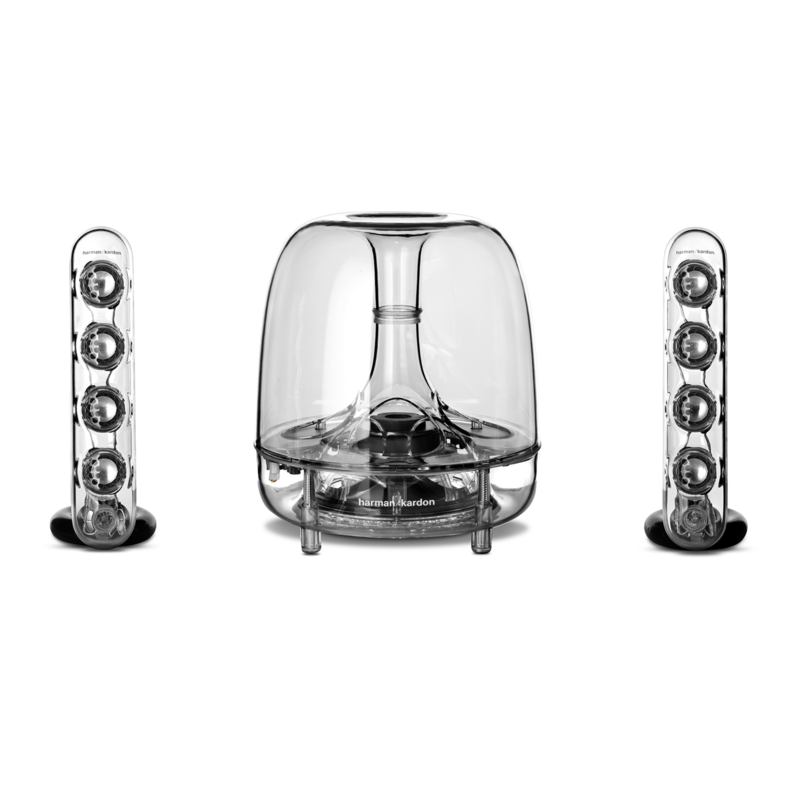 The subwoofer also has a flared port that reduces port noise during high-volume passages. This feature helps you tailor sound levels based on your room’s specifications as well as your own listening preferences. Fill the room with eight full-range transducers. 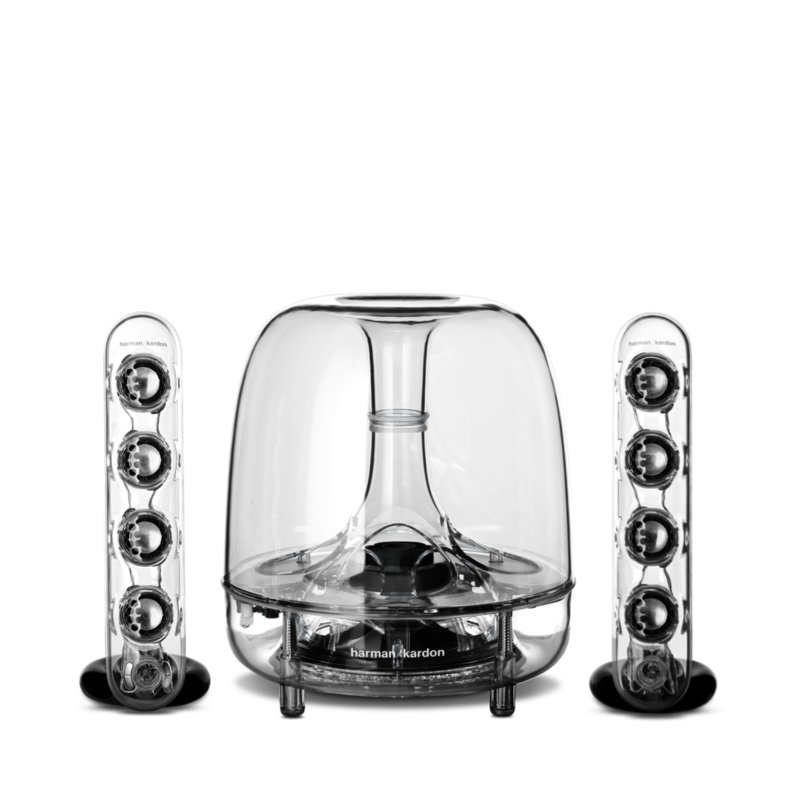 The harman kardon brand has a rich history of engineering sound with highly regarded results. The SoundSticks III system is no different, coming with eight full-range transducers (four in each speaker) and deftly filling your room with great sound, while increasing your power handling and audio output. With less distortion and better sound quality, SoundSticks III speakers ensure that you’ll hear music or video exactly the way the composer intended. Control the angle of your satellite speakers. Elegant and easy to use, SoundSticks III satellite speakers are designed to fit exactly where you want them – and maybe even in a few other places. 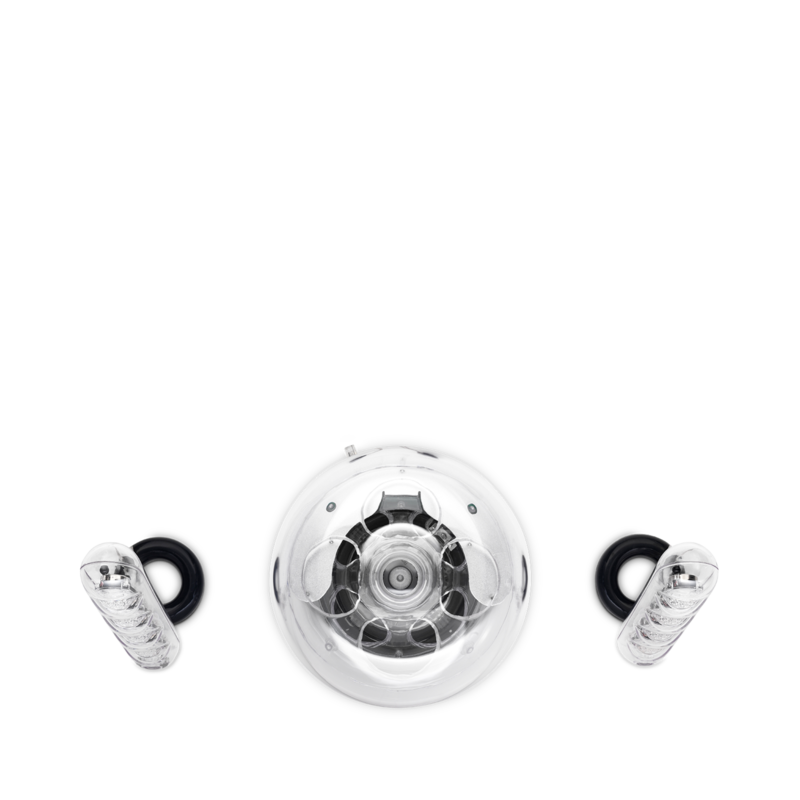 As a modern design feature that’s adaptable to your environment, the SoundSticks III system has two angle-adjustable satellite speakers that bend from low angle to high. Gently push or pull each satellite to the desired position – and you can optimize the angle at which sound enters, and fills, the room around you. Modern design with black accents. The SoundSticks series is a colorful landmark in harman kardon design history – and one such color you’re bound to notice on SoundSticks III speakers is: black. 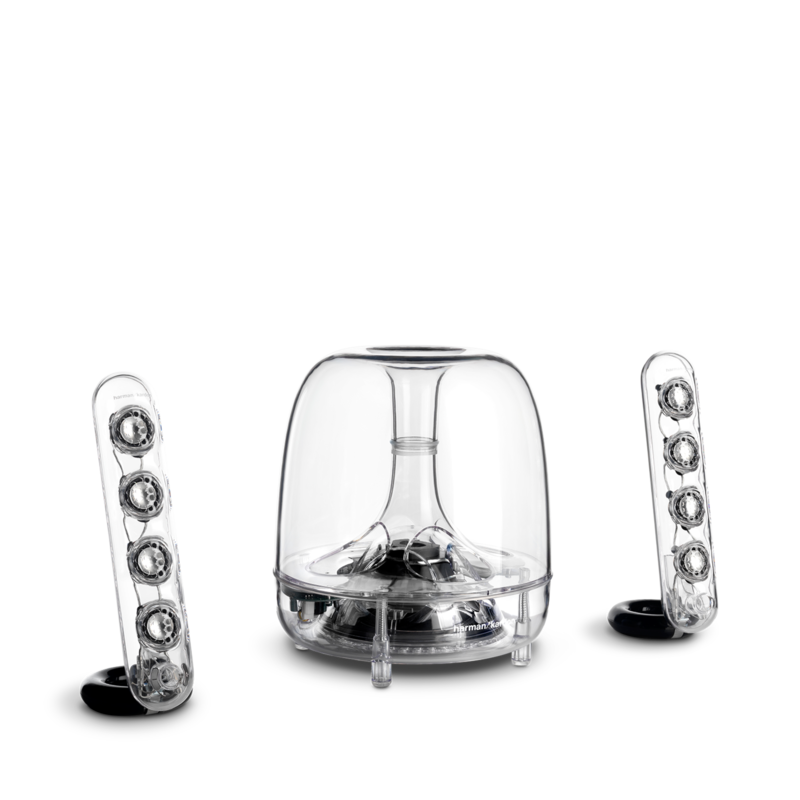 Designed to match perfectly with other design-driven industry heavyweights such as the Apple iMac, MacBook, MacBook Pro and even the iPad, the SoundSticks III system integrates several black accents into its transparent design that make it an ideal complement for computers of all shapes and sizes. Some of these accents include black connection beads, which elegantly adorn the interior of each satellite speaker, a new black ring inside the subwoofer and a new ice-white LED in the subwoofer, giving all the black accents a classy glow. As a suitable complement to the previously mentioned products as well as other electronic staples such as DVD and Blu-ray Disc players, SoundSticks III speakers have no shortage of design aesthetics to help them stand out from the rest. Detachable audio cables keep you connected. 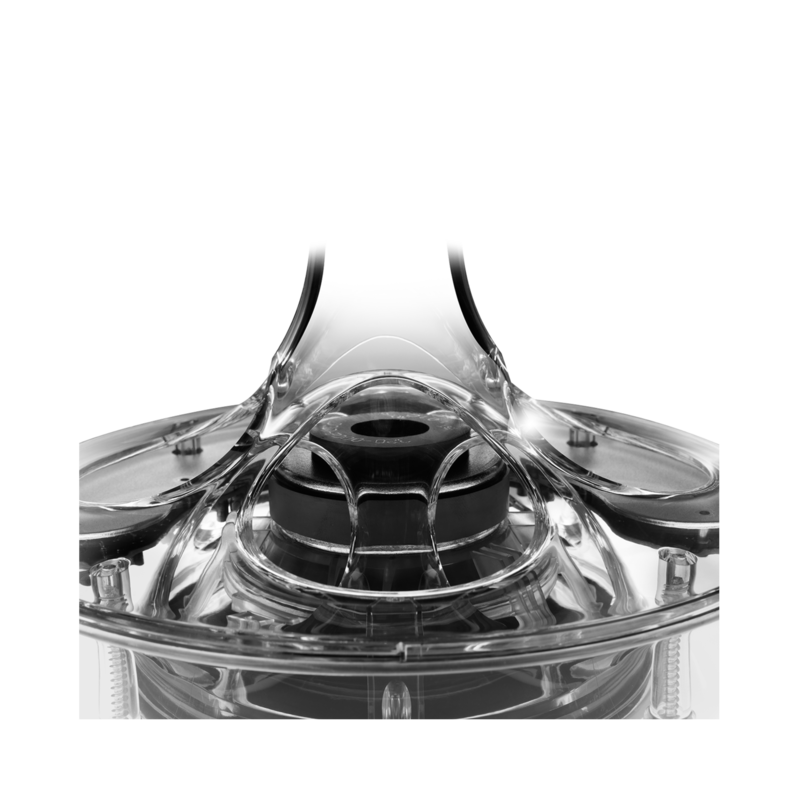 Form meets function meets flexibility: That’s one of the key principles behind the SoundSticks III design. And whether you have a desktop computer or a laptop, the SoundSticks III system works and plays well with others thanks to detachable audio cables, which you can easily replace if they happen to get damaged. In addition, this flexible feature also gives you the freedom to use the SoundSticks III system with other types of input cables (not included) – ideal for connecting to a games console, DVD/Blu-ray Disc player, TV or any other device that has an analog output. Some manufacturers make audio cables a bare-minimum expense, which can compromise the integrity of an audio product and, potentially, the look of it. The SoundSticks III system does no such thing. SoundSticks III audio cables match the high-quality, transparent modern design of the speakers in terms of quality and visual appeal – and live just underneath the transparent speaker covers as if being showcased. Kept in place by black connection beads, these premium audio cables ensure that audio travels from source to speaker, without any sign of degradation or outside interference. Is it possible to improve what’s already perfect? Praised for its stunning design at the MOMA in New York, the original SoundSticks® system has become another Harman Kardon® design landmark. SoundSticks III is all that and even more. A 6-inch, 20-watt downward-firing powered subwoofer. Eight 1-inch full-range transducers. Plug-and-play compatibility with virtually any multimedia device. And stunning industrial design that perfectly matches the clarity of the sound. The Harman Kardon SoundSticks III desktop sound system brings a new level of excitement to music, games and movies with a minimum of wiring – and looks spectacular doing it.